Islamic State (IS) has released an audio message it says is from its leader, Abu Bakr al-Baghdadi, which if confirmed would be the first in months. The message urges Muslims to emigrate to the "caliphate" it has proclaimed in areas of Syria and Iraq. A reference to the Yemen conflict means it is recent. Analysts say the voice appears to be Baghdadi's but this is not verified. Baghdadi's fate has been unclear amid reports of air strikes by the US-led coalition that is opposing IS. The message came as IS advanced to within 2km (1.2 miles) of the Unesco World Heritage site of Palmyra, one of the archaeological jewels of the Middle East. Syria's antiquities chief warned that if IS seized Palmyra it would destroy everything that exists there. The latest message was released by the group's al-Furqan media outlet and appeared on several websites. The voice on the audio recording is clear, assured and, in places, almost melodic. If it is indeed, as is claimed, the voice of Abu Bakr al-Baghdadi, then it will put paid to previous rumours of his death. Since we don't actually see him he could, of course, be physically incapacitated. But the lengthy, 33-minute speech does not sound like one made by someone in failing health. The speaker, who makes continual use of religious quotations, exhorts Muslims around the world to join forces with his group. Most significantly, he mentions the Saudi-led bombing campaign in Yemen which began on 26 March, meaning this recording can be no more than seven weeks old. US government linguistic experts will have doubtless been quick to analyse the voice patterns on the tape to see if they match earlier recordings of Baghdadi when he appeared in vision last year. The speaker says: "There is no excuse for any Muslim not to migrate to the Islamic State... joining [its fight] is a duty on every Muslim. We are calling on you either to join or carry weapons [to fight] wherever you are." He adds: "Islam was never a religion of peace. Islam is the religion of fighting. No-one should believe that the war that we are waging is the war of the Islamic State. It is the war of all Muslims, but the Islamic State is spearheading it. It is the war of Muslims against infidels." IS declared a "caliphate" over parts of Iraq and Syria in June 2014. The speaker in the message says: "There is no might nor honour nor safety nor rights for you except in the shade of the caliphate." The speaker also makes references to the recent Saudi-led air campaign against Shia rebels in Yemen, which began on 26 March. He condemns the Saudi royal family and says the conflict in Yemen will lead to the end of its rule. Baghdadi's last message was in November. His only public appearance was to deliver a sermon in Mosul in Iraq after IS took the city last July. 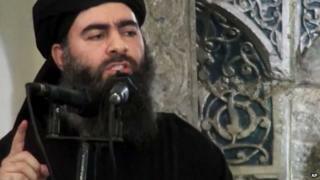 An Iraqi interior ministry spokesman said in April that Baghdadi had been seriously wounded in a coalition air strike in March. However, the Pentagon said it had no information on that, and other reports last year of him being injured proved to be inaccurate. The Iraqi ministry of defence said on Wednesday that the second-in-command of IS, Abdul Rahman Mustafa Mohammed, was killed in an undated coalition air strike on a mosque in northern Iraq. But the US said coalition planes had not attacked a mosque.